The Classic Industries Camaro catalog is the largest distributor of reproduction and original GM parts and accessories in the world. With over 30 years of experience, Classic Industries supplies drivers with the Camaro restoration parts needed for their 1st, 2nd, 3rd and 4th generation Camaro models. Enter the Promo Code - C73CM - at checkout on the Camaro Parts from Classic Industries website. Camaro restoration parts - Make your Camaro restoration an easy ride with the Camaro restoration parts that are just right for your automobile. Whether your car needs new AC/Heating components, exterior body parts or audio components for your car stereo, you'll find an extensive selection that will improve and polish every inch of your Camaro vehicle. Classic Industries Camaro catalog - Classic Industries is the recognized leader in GM restoration for classic Camaros featuring hard-to-find Camaro restoration parts for 1967, 1968 and 1969 models. You'll also find Camaro parts for younger models from the next few decades up, with parts available up to the year 2002. Camaro performance - Improve your car's true performance with the Classic Industries collection of Camaro performance parts. Shop for brake, engine and exhaust components, transmission, steering, suspension and other performance parts conveniently listed by year, either online or in the pages of their Camaro catalog. 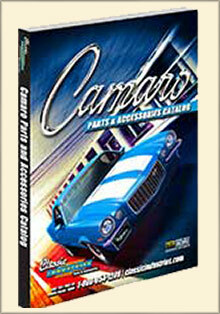 Camaro accessories - The Classic Industries Camaro catalog brings you all of the accessories you need to perfect every detail of your classic Camaro. Find a wide selection of car and seat covers, floor mats, license plates, bumper stickers, decals, interior accessories and electronic Camaro accessories. Plus, shop for Camaro themed gifts and novelty items for the Camaro lover in your life. From Camaro wheels and tires to clutches and sunshades, the Classic Industries Camaro catalog is the car bible for Camaro owners, bringing you the Camaro restoration parts needed for any major or minor Camaro revival.